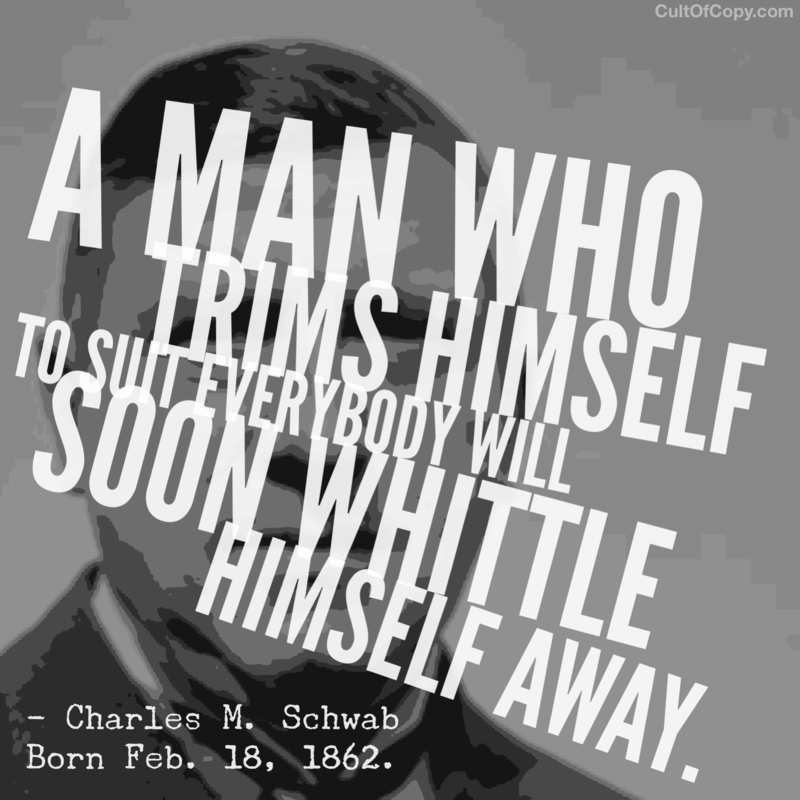 “A man who trims himself to suit everybody will soon whittle himself away.” -Charles M. Schwab, Born Feb. 18, 1862. An offer that is for everyone excites no one. Product, service, or persona – it's all the same. If you try to please everyone, you can only please each of them a little, and therefore, you'll also disappoint them all a little, too. Be FOR something, and someone SPECIFIC. 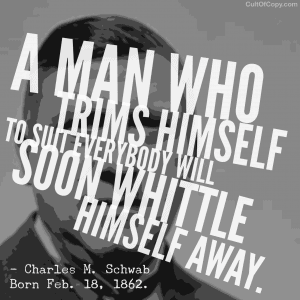 And if you do that with the proper amount of vigor, you will automatically be something that someone else just HATES. But that is something you have to take if you want to be someone's favorite. That's just how tastes across humanity vary. No sense getting upset. What I recommend to accomplish this is to be yourself. It exudes from you and coats your offers, too – like glaze on a warm donut. And it lets you engage your audience as a whole person. It lets you be honest. It lets you be trustworthy. It lets you seem like a real person they want to get to know. And by this very simple action, you appear as something much more substantial than your competition for their attention. Because you seem complete, while everyone else who tries to please everyone feels hollow. They are whittled down to a mildly interesting sliver. People like that aren't followed. The best they can hope for is to be tolerated until replaced. They have no spirit. They have nothing to move the emotions of a prospective fan. No essence. No spark. Don't do that. Don't be that. Be the opposite of that and you can gather fans (who buy stuff) no matter what you want to talk about. Ask yourself – Do I seem like a real and complex person to you? Or do I seem hollow and shallow? I like to think that I make it clear that whether you agree with me or not, you can trust that my opinion is well considered, and that I take it seriously. I'm willing and able and LIKELY to defend it if challenged. I care about the QUALITY of my opinions BECAUSE I share those opinions with people as ADVICE, so I want to be accurate and transparent and legit. Think of other online personalities you may follow. Do they try to suit all tastes? Or do they just express themselves as they are, and gather a fan base that happens to resonate with? Which of the people you follow do you TRUST more? Which do you feel like you KNOW better?